Since reading your book my life has changed and am more aware of gathering positive mentality from any kind of event or situation except one and it’s one I come across on a regular basis. Trying to share positivity and be positive towards others even the smallest thing,i.e. smiling at a stranger sometimes I am greeted with negativity or general rudeness. When this happens I become a bit deflated as it were and maybe a tad disappointed and it then becomes a downward spiral of why do I bother almost. How do you maintain a steady positive attitude in a negative world? The main thing for me to stay steady with positivity is to stay true to the 12 daily habits of a TAL on the MTA poster. If I stick to my simple routine of doing those habits each morning – it sets me up powerfully to win all day long. When I’m confident enough in myself, and happy from within, other’s responses don’t phase me that much. Or I see them with compassion instead of criticism. …We can’t force other people be positive. …it seems everything and everyone becomes more offensive. So I recommend using those habits as a checklist each day and just powering yourself up with them before anything else. …if other’s respond poorly to your positivity, it could be that they may feel it is being ‘forced’ upon them. We can learn a lot about ourselves if we embrace that statement as truth. …only then can we improve upon them and improve upon the responses we get from others. …Because they are hurting inside. So don’t go beating yourself up and taking everyone else’s problems on yourself by thinking everyone’s reactions are your fault. 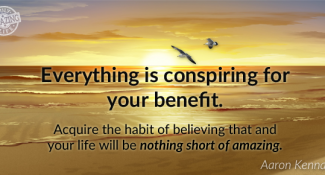 Just be aware…that often, our tone or our words can induce negative reactions in others. I love to remember that ‘the meaning of my communication is the response that I get’, because it puts ME in the driver’s seat of my life. If I’m getting lots of negative responses – I remember I can do something about it. P.S. 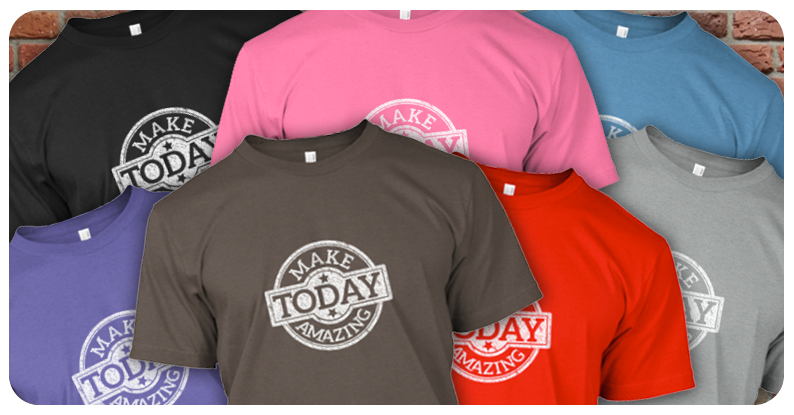 – These are the two most popular ‘Make Today Amazing’ Shirts so far – and they both go away as of TODAY – in just a few hours actually! Act quick if you want to get one – I’m not sure when they will be available ever again. 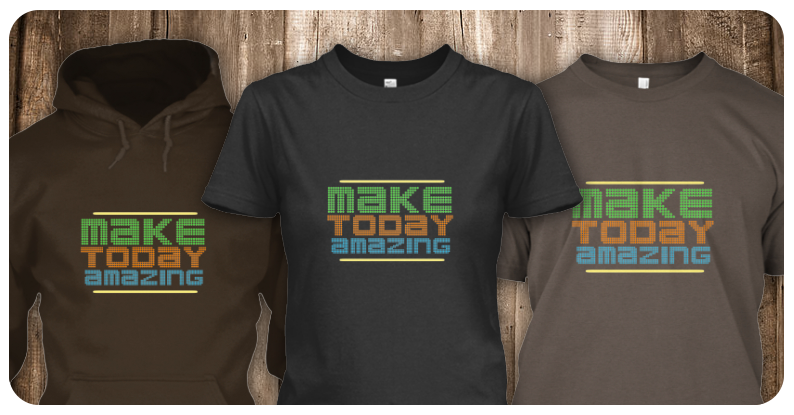 (The brown T-shirt version of both types appears to be discontinued after this campaign unfortunately, last chance to get it).